This is a guest blog post by Clay Boggess, Senior Consultant at Big Fundraising Ideas. When Jamal was in college, he and 15 other students volunteered to help build a house for a low-income family. About an hour into painting trim, Jamal made so many mistakes, he wondered how he’d ever finish the job. It was then he noticed another student struggling to lay new sod on the lawn. Jamal grew up helping with his dad’s landscaping business, so he knew his skills would be put to better use outside. A quick conversation with the student revealed each was better suited for the other’s role. Jamal wondered if the same situation was happening elsewhere in the house and after a few conversations, helped switch more roles on the project. With each student working on the role best suited for him, the house was finished a full day ahead of schedule. What’s the takeaway? Assigning roles without understanding the individuals who are filling them can mean missing out on setting volunteer teams up for maximum success. Community volunteering, especially when it comes to fundraising, is by no means a cookie-cutter job. Understanding some of the key motivations, behaviors, strengths and weaknesses of different types of volunteers is key to forming effective teams that delivers success and helps improve the quality of life in your community. 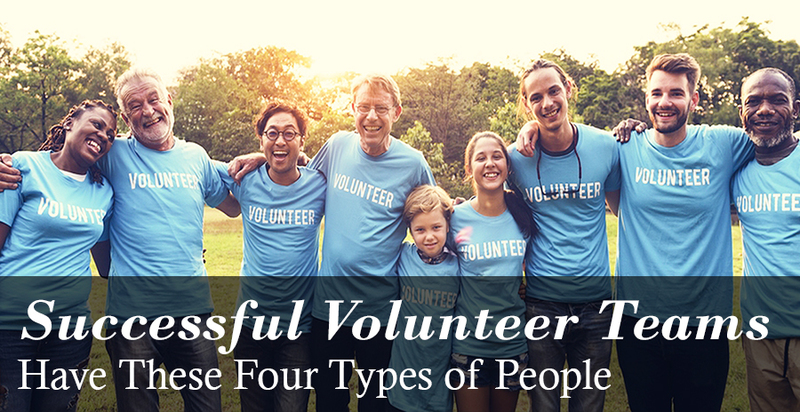 From my experience, there are four types of people, or personas that make for successful volunteer teams. I'll guide you through each of their motivations, which tasks they're best suited for, their behaviors, strengths, and opportunities. Where are the gaps in our team? Which persona most describes me? Which persona least describes me? What changes can our team make to help motivate these different personas? These guiding questions can help you approach and cultivate your team dynamic by putting volunteers in the right roles and delegating tasks in a way that makes everyone feel like they’re at their best. When you do, you’ll see more commitment, increased retention and less time invested in training year-over-year. Set aside some time upfront to have one-on-one conversations with your team members and get to know their passions and strengths. Then, talk with them about what roles and responsibilities they’d like to undertake for a project. This persona feels at-home in spreadsheets and facts. Motivations: Making progress on the bottom line motivates those who are “data-driven”. They feel good when weekly reports are given about the status of projects and goals. They are empowered when metrics are included in the decision making process. Setting quantitative goals and collecting and sharing data will maximize the impact of this persona. They may frequently ask for updates on volunteer engagement, attrition or recruitment. They will likely be hyper-organized. They may prefer graphical depictions of processes as opposed to lengthy verbal instructions. Delegate tasks that require distillation to them, like organizing direct mail projects and scrubbing lists for volunteer prospects. They will also be valuable evaluators once the project is over to help you assess where you performed well, and what opportunities exist for next year. Strengths: The most successful teams rely on facts to make informed decisions, and your data-driven team members can help you get to these facts with ease. They will keep your strategy and timeline on track by enforcing benchmarks and letting you know how close you are to reaching your goal. Data Heads are often at ease with technology, which you can leverage for cost and time efficient processes. Opportunities: The data’s in the details, so you may find that this persona can miss the big picture while sweating the small stuff. The finite nature of numbers games can make it difficult for them to cope with sudden changes or compromises. Work with them on remaining realistic and mediating their spreadsheets with the infinite complications associated with running a major project. If you’d like to understand this persona to a greater level, here are five additional characteristics of data-driven people. Volunteer teams needs a Don Draper — someone with the keen ability to just know what an audience will want. Just as Draper could develop creative ad campaigns for corporate giants that propelled them to success, these “Mad Men” of the community service world are all about curb appeal. You’ll want them on your team if you need to get a message and a mission across in style. Motivations: We live in a world with more noise than ever, from cluttered social media feeds to radio ads on our music streaming apps. Creative design and communication has a big role in community service and fundraising, because it helps cut through this with attention-getting calls-to-action. Folks who value creativity are motivated by cohesion, aesthetics and identity. They seek unity in the message and purpose of the fundraiser, and want it to look good while doing good. They may also be motivated by relevance and current trends in pop-culture, and often have personal artistic or creative hobbies, like photography or painting. Behaviors: Creative types will often want the last gloss on something to tidy it up and make it sure it looks and feels like your “brand.” In the corporate world, these folks would adhere strictly to a style guide and moderate details that less aesthetically-focused people would consider insignificant. They may make suggestions that seem critical, but are actually focused on piercing through obstacles that are often encountered in community volunteerism by creating a compelling image and message. In elementary schools, for example, where volunteerism and fundraising help fill critical gaps in classroom support, the creative mind can be especially valuable. Schools offer creative types a particularly valuable opportunity to exercise their skills, because they are able to provide innovative presentations of information to engage students and extract the “educational moment” in an arts and crafts project. Because creative types tend to be more in-tune with current trends and new types of media (like apps and social platforms), they’re likely to gel well with people who use social media in fundraising and volunteerism. You have a great asset in these folks who intuitively understand how to make an appeal that will reach your unique audience. They can also offer a team a sense of unity by dreaming up a creative concept that helps people relate to the mission of your fundraisers. Opportunities: Creative types are often not as keen to adhering to budgets (but can benefit from being given one), which is a natural consequence of the price of appealing marketing collateral. If you or someone on your team has creative strengths, know that their abilities often arise out of non-conventional ways of thinking. You may find that they share some of these common characteristics, such as thinking in the abstract and gravitating toward fluid, changing work environments. This can be a challenge for volunteer groups that often demand “all hands on deck.” If you don’t have any expressly creative work to share, motivate them by offering up practical tasks related to creative vision, such as getting packets printed or putting together goodie bags. When it comes to recruiting, celebrating or engaging volunteers, events are a polarizing task: people who are oriented toward logistics will love them, and people who dislike lots of moving parts will shy away from them. Motivations: The big reveal motivates Events Experts. They like seeing people come together for an experience. They like combining elements to create an effect. In large-scale fundraising, event coordinators often seek exposure and acclaim in the form of earned media. Similarly, they’ll love if their project is the talk of the town. Volunteer event coordinators will function best with a committee to support them; their tasks are plentiful, and they’ll feel most positioned for success when they have folks working alongside them. Behaviors: Timelines and schedules rule the world for events people. They’ll want to know how things flow and fit together, and likely seek to plan ahead and develop contingencies; after all, nothing is worse than when a major piece of an event falls through without backup. Events Experts are also likely to cast grand visions, but can still commit to details when needed. Selecting spaces and laying out a map of the event. Opportunities: For people used to community or fundraising events (5Ks, marathons, dance-a-thons, carnivals, etc. ), they may not be able to see how to translate their skills into something workable for a product fundraiser. Their solutions may be limited to those that bring people together. Engage them in helping set-up meetings to keep them motivated throughout, and ensure they have the support of other volunteers to execute a successful event. Volunteer projects require an enormous amount of energy for success. Motivators fill in the encouragement gaps when times are tough. Successes are easy for most personas to celebrate, but the strongest volunteer teams — and the ones people will want to return to year after yea — have members who can lift up the group by offering encouraging words and leading by positive example, no matter what role they’re in. Motivations: Making other people happy makes Motivators happiest. This is a huge asset for the team when faced with challenges. They like the “warm and fuzzies,” and want the whole process to be chock-full of team synergy. Incidentally, a lack of success may also be motivating for the motivator, as they are particularly sensitive to when team morale is low. Behaviors: Motivators are the source of encouragement. They’ll regularly offer positivity during meetings and highlight success. Motivators tend to be high energy, social and conversational. Their ability to empathize will make them the first to offer a complement, highlight someone else’s success or help them overcome a creative challenge. This can rub some people the wrong way, but when channeled effectively, can have a net positive effect on the volunteer experience. People may feel compelled to give more, which can maximize on your investment of time and talent. Clean-up crew members, who need a positive attitude after the curtains close. Put them in the community or at the check-in table; these friendly faces will make a great first impression. Opportunities: The realities and difficulties of volunteer projects, especially in fundraising settings, can hit motivators hard. They’re susceptible to demoralization if goals aren’t met. Remember that your motivators need motivations, too! Don’t panic if you can’t fill all of these roles on your own team; there are plenty nonprofits who have met their goals with less. Last year, I worked with a group of just five high school students. The Creative Types helped create eye-catching sponsorship packets, while the Motivators got out into the field and wooed their way into $10,000 worth of sponsorships. Send out a questionnaire in the preliminary stages of your project to collect information about what makes each volunteer tick. Have a one-on-one coffee and conversation, and solicit their input. Ask volunteers directly what type of worker they are, and what excites them. Ask volunteers to self-identify with these personas, and give them freedom to add to, or finesse these descriptions. Over the course of the project, keep on the lookout for these particular skills and personas, as they can create an unstoppable team dynamic that will help reach new audiences with greater efficiency and impact. Don’t be afraid to change midstream, so long as it won’t cause greater inefficiency. When volunteers, like Jamal, identify roles they’re particularly suited to, it can lift the whole team up. Flexibility and the willingness to change will make people feel comfortable sharing their strengths and asking for roles. Of course, these characterizations are generalizations. Your teammates may be able to operate in many of these modes simultaneously. Take the time to get to know the volunteers who are making the fundraiser possible, and ask them what they’re passionate about and what role they seem themselves playing. No matter what persona you relate to most, interpersonal skills are the glue that will create a rock solid volunteer team. Clay Boggess has been designing fundraising programs for schools and various nonprofit organizations throughout the US since 1999. He works with administrators, teachers, as well as outside support entities such as PTA's and PTO’s. Clay is a Senior Consultant at Big Fundraising Ideas.